Looking to shred up while preserving muscle? Then you need to try sprinting. Use this easy-to-follow progression to start losing fat faster. Sprints are hard. But they’re only hard for a little while, unlike the 30-45-minute steady state runs that are still the hallmark of so many routines. But those who are willing to push their stride to the max for a few brutal minutes are often rewarded with more burned bodyfat, a higher resting metabolism and more muscle preserved. The science is legion (and growing) but here’s a condensed helping of some of the awesomeness that interval-style sprinting has to offer. >> Increases Power: Research suggests that high-intensity interval sprints can help to increase your body’s mitochondria count. More mitochondria, referred to lovingly as the “powerhouse” of your body’s cells, means more fuel burned and more energy produced by working muscles. This has enormous carryover to pretty much anything involving movement while also making you leaner and more powerful. >> Increases Fat-Burning: Sprint workouts are, by nature, shorter so they may not burn as many calories as a typical steady-state workout. But a single session of high-intensity training can boost post-workout fat oxidation by 75 percent. Think that can help you on your way to Leanville? >> Preserves, Builds Muscle: Oh, and did we mention that sprints are actually anabolic, meaning that they have the potential to build muscle? This is likely due to their emphasis on growth-prone fast-twitch fibers. This is a stark contrast to the muscle-wasting potential of extended steady-state sessions. You might know all of this already. But, reluctant to subject yourself to the rigors of serious sprinting, perhaps you’ve not yet tested the validity of the science. And with so many studies out there, you may be wondering which protocol is right for a test drive? Without burdening you with the many interval set-ups that have been tested, it is sufficient to say that there have been many. Test subjects have run sprints anywhere from 8 to 30 seconds long with rest as long as four full minutes. And, in general, the longer the sprint, the fewer of them are needed to elicit the touchdown responses you’re after. For HIIT newbies, one great way to test the waters is to work on minute-long work/recovery bouts. That means you devote a certain portion of each minute to sprinting and the rest to recovery (walking or light jogging). This will allow you to work up to peak intensities repeatedly, without laying yourself out for the medics. But as with any training methodology, progression is the key. Sprinting farther, faster or more often is ultimately what’s going to have you looking like an Olympian. This starter’s guide is a simple, effective way to introduce yourself to the benefits of sprinting over the next six weeks. For each workout listed, you should first perform a dynamic warm-up that includes several minutes of progressively tougher activity. One example would be 20 seconds each of jumping jacks, jogging in place, leg swings, lunges, side lunges and jump squats. Ease into your workout with 1-2 minutes of light jogging before launching into your first sprint. For perfect interval timing, pick up a GymBoss (www.gymboss.com) to keep with you, download a free interval timer, or just watch the clock. >> Perform each week’s workout two – and no more than three – times per week. 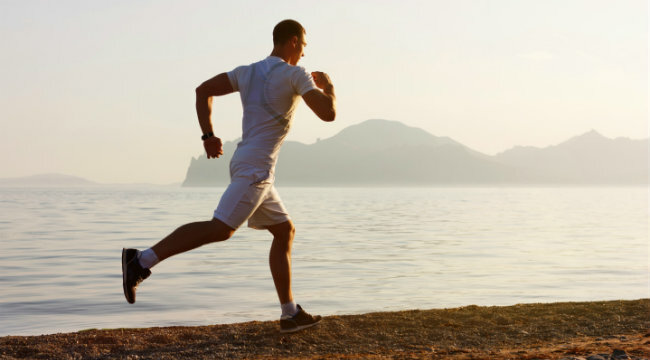 >> You can perform these sprint workouts outdoors or on a treadmill. With the treadmill, you want to get the belt up to speed and simply step off, using the handles, for each recovery interval. >> Don’t focus on percentages, VO2 maxes or heart rate. Simply run as fast as you can during each sprint and the rest will take care of itself. >> Running form directly affects speed, which affects fat-burning. Keep your arms bent at 90 degrees and pumping aggressively alongside your body during each sprint. Crossing your arms toward your midline, even slightly, will alter your gait and bleed speed. Also, aim for a midfoot strike, as heel contact with the ground will add unneeded stress to your joints while also slowing you down. >> For best results, perform your sprints on dedicated cardio days.